Know someone who wants to learn guitar, bass, drums, piano, ukulele, or voice? 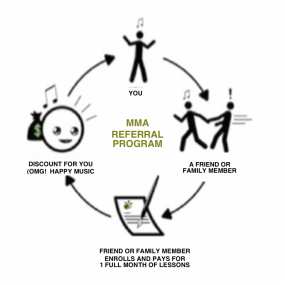 Refer them to MMA and if they sign up for 1 month of lessons we’ll give you $25 off your next months tuition! ** It's as easy as 1-2-3! 1. Just call us at (208) 882-6733 or fill out the form below. Type in your name, their name and their email address and we’ll take care of the rest! There’s no maximum to the amount of free referrals and savings you can receive! 2. They sign up for lessons. The referred student must register, include your name (as the referrer) on the registration form, and enroll for a minimum of ONE FULL MONTH of lessons in order for you to receive your $25 referral coupon. 3. You receive your $25 Referral Reward coupon! We will apply ONE (1) $25 referral reward coupon per each months tuition. For example, if you make two (2) referrals and those referrals both register for lessons, a $25 referral reward coupon will be applied on your next two (2) SEPARATE months tuition. A value of up to $50.00! We greatly appreciate your referrals and thank you for helping Moscow Music Academy grow! ** Only applies to Moscow Music Academy students currently enrolled and taking lessons.